This is not a game mod, but a utility for XML Modders and those who want to become XML Modders. The Tuning Description Browser has been around since early 2015, but I've come to find lately that a lot of modders are (pleasantly) suprised to find out about it's existence. 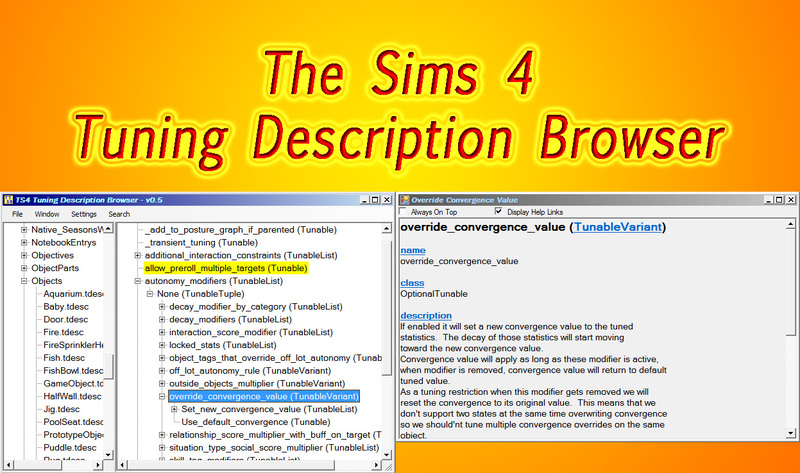 With the addition of a search feature for the program, I thought it was probably time to give it a bit more visibility instead of having it buried in an obscure forum thread here on Mod The Sims. default="Use_default_convergence" display="Override Convergence Value" muid="61D39E7F7BF578B8"
&#xA;so we should'nt tune multiple convergence overrides on the same &#xA;object." Deprecated="False"
Ugly, ain't it? Trying to wade through thousands of lines of this XML to find out what a particular XML element means was enough to discourge many modders from even bothering with using the TDesc files. But the information in them is absolutely invaluable, or in my opinion, critical for the XML modder who wishes to understand the XML code. Loads all the tuning descriptions contained in the TDesc files into an easy to navigate tree structure. The detail window features the tuning's name, it's Python class, the full description, defaults and export modes. Help links are available for various terms in the Detail window. The text for these help links was taken from EA's TS4 Custom Content Guide. Tuning elements can be searched for by name, description and Python class. Multiple versions of the TDesc files can be browsed. Multiple windows can be opened to compare tuning descriptions from game versions side-by-side. The version history for the tuning descriptions is indexed, tuning descriptions which have been renamed will have a clickable link to navigate to an old muid if available. The program is available as either a standalone EXE file, or with a standard Windows MSI installer, so that portion of the setup is fairly easy. However, it is necessary to obtain a copy of the TDesc files from EA and extract them into an appropriately named subdirectory. First, you will want to create a new folder for all TDesc files you wish to have available. This can be anywhere on your hard drives, likely targets being a subfolder of your Documents folder, or somewhere on your Desktop. Name it something appropriate, I gave mine the dull but descriptive name "Tuning Descriptions". Download the latest version of the TDesc files from the Mods & CC Technical Discussions forum at EA. The latest TDesc download should be in a sticky message at the top of this forum. You will have to search the forums for any older TDesc downloads if you want those (a search for TDESCS will do the trick). Inside the folder you created in step 1, you need to create a subfolder for each Version of the TDesc files you want to keep. This folder should be named with the proper version number. You don't need to have multiple versions of the TDesc files if you don't want to be able to compare or reference back to older versions. However, for proper program operation you must have at least one appropriately named version folder. The downloads from EA always have the version number in the filename, so for the latest TDescs at this time, 1.44.77-TDESC.zip, you should create a subfolder named 1.44.77. Now extract the folders and files from the TDesc file or files you've download into the appropriate version folders. Each version folder should then have subfolders named AchievementCategories, AchievementCollections, etc. that contain Description subfolders which house the .tdesc files. Once you have your TDesc folder structure and the files in place, you can start the program and it will allow you to select where your files are stored. You should select the folder you created in step 1 above. If necessary to move your folders at a later time, you can select a new data folder from the Settings menu of the browser. From the Window menu, you can select New to open a new browser window. Any tuning descriptions selected in the new window will create a new details window so that side-by-side comparisons can be performed. Tdesc Root Folder allows changing the location where you have stored your TDesc files. When enabled, newly added or changed tunings will auto-expand in the right-hand tree so they can be quickly seen. Tunings highlighted in yellow have been changed from when they were introduced. Tunings highlighted in green are newly added. Larger Fonts will increase the font size in all windows by 25% to make them more readable. If you have multiple versions of TDesc files installed, only the most recent version is searched. 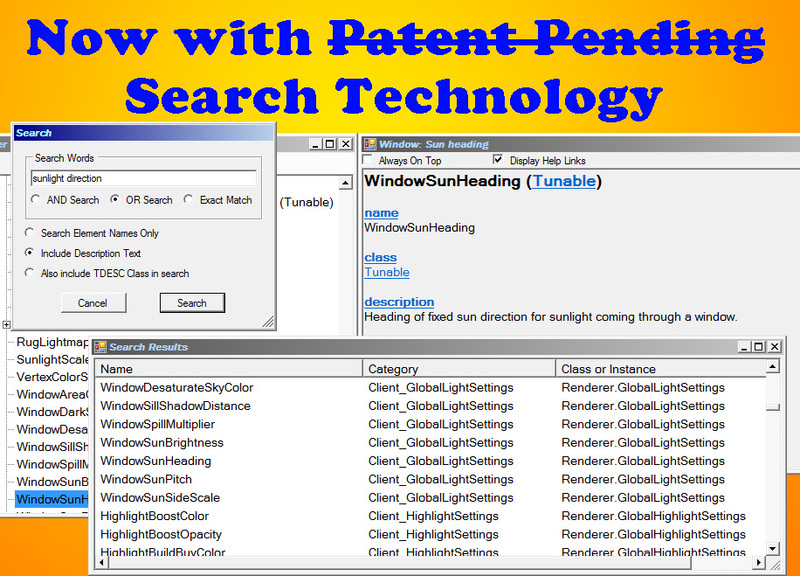 Multiple search words can be entered. AND Search mode requires each word in the search to appear at least once in any of the selected search locations. OR Search mode requires at least one word from the search to appear. Exact Match search mode will require an exact match for the element name or class. A description must contain the search words in the order listed. Searches are always case-insensitive (even in Exact Match searches). Searches which are not selective enough will return a large number of matches. All those over the years who have encouraged me to write this. The code for the RichTextBoxEx was rewritten for Visual Basic from code by mav.northwind at codeproject.com, originally by Shibu Matthew. Links for the original authors is included in the sources.